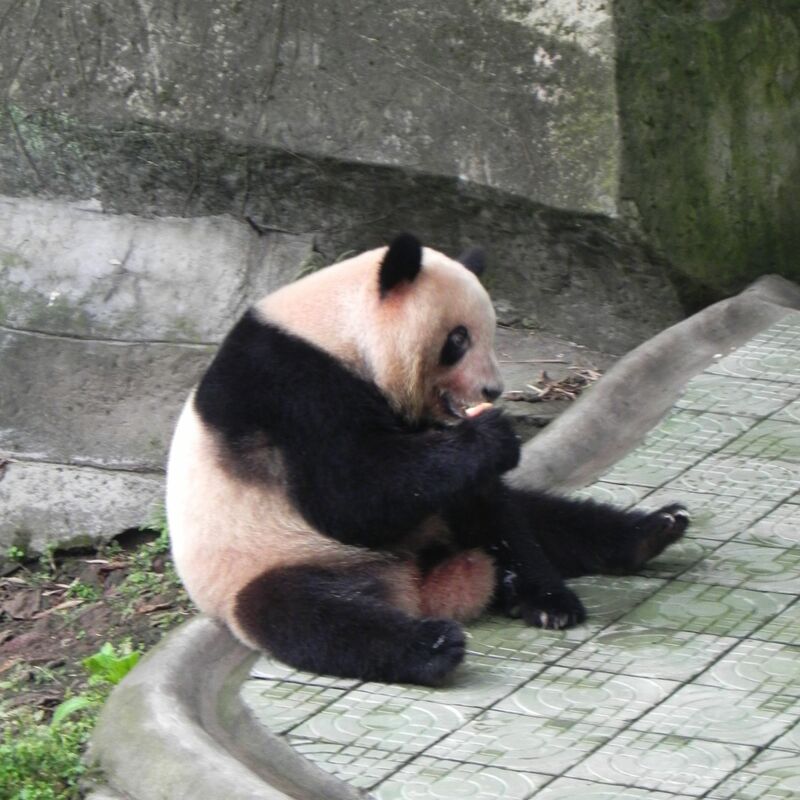 The Chengdu Research Base of Giant Panda Breeding is located in the northern suburb of Chengdu (Sichuan Province, China) in the Futou Mountains. It encompasses almost 100 hectares of green hills, bamboo forests and the beautiful, sparkling-clean lake with the large populations of Mandarin Ducks, full of grace swans and black-necked cranes - to name only few. 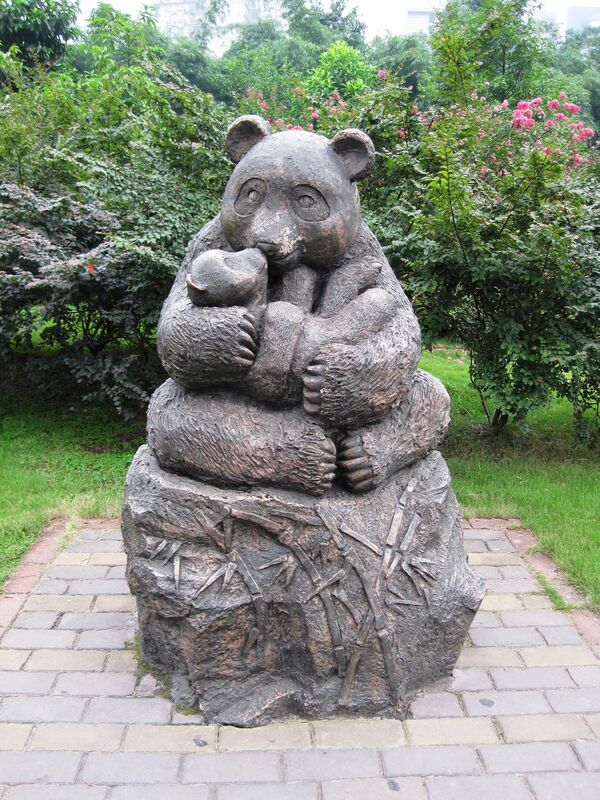 The center is dedicated to the conservation of the famous Chinese endangered species known as Giant and Red Pandas. 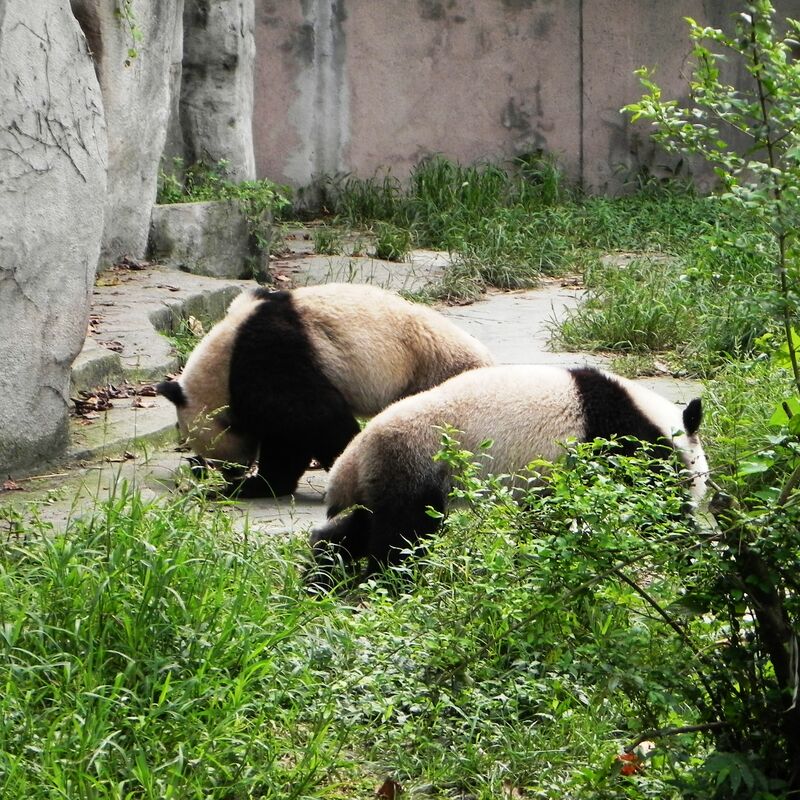 The Chengdu Center was established in early 50-ties - mainly as the place keeping pandas in captivity. 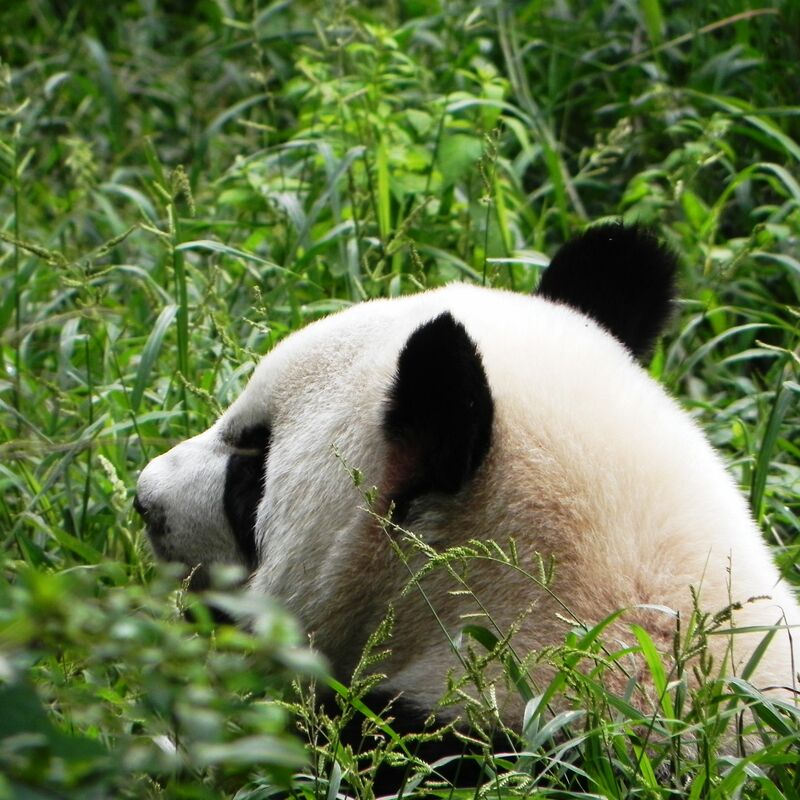 The scientifically-backed operations started there in 1986 with the opening of the Research Base of Giant Panda Breeding. 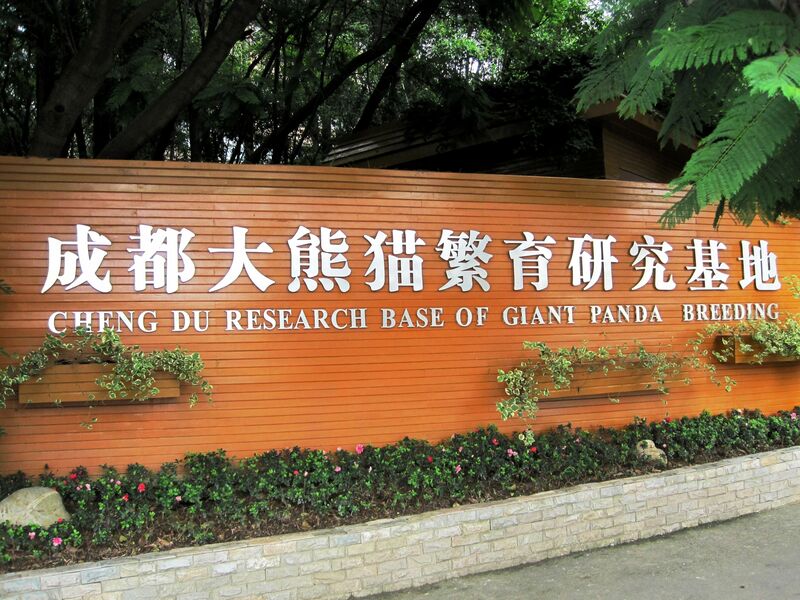 Entrance to the Chengdu Research Base of Giant Panda Breeding. 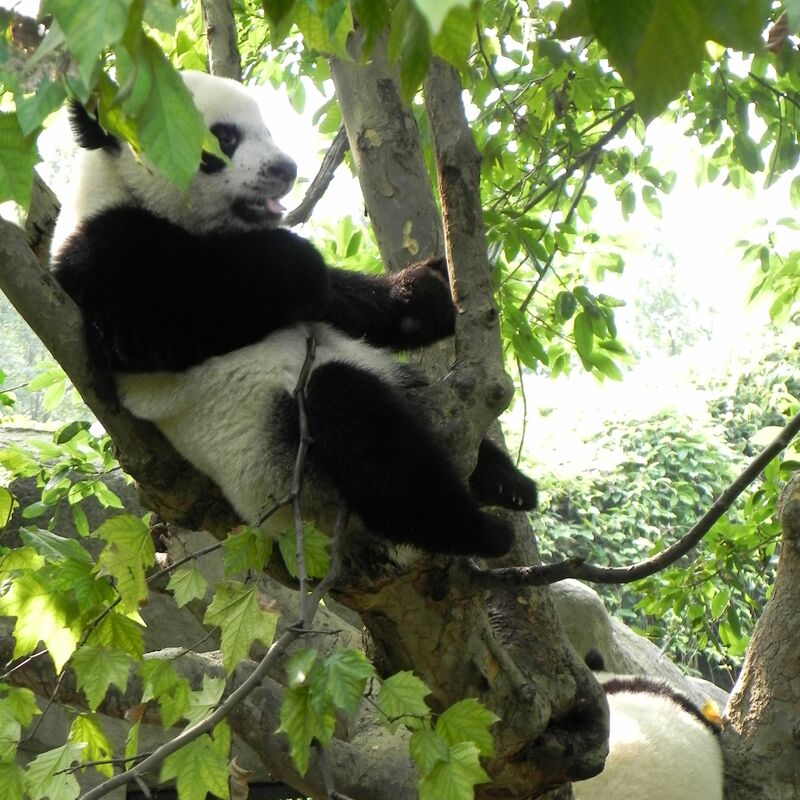 Since then the Chengdu Base earned the world’s recognition as one of the most successful panda breeding centers sharing many breakthroughs with its partners in Atlanta ZOO (USA) and Adventure World in Shirahama (AWS), Wakayama (Japan). 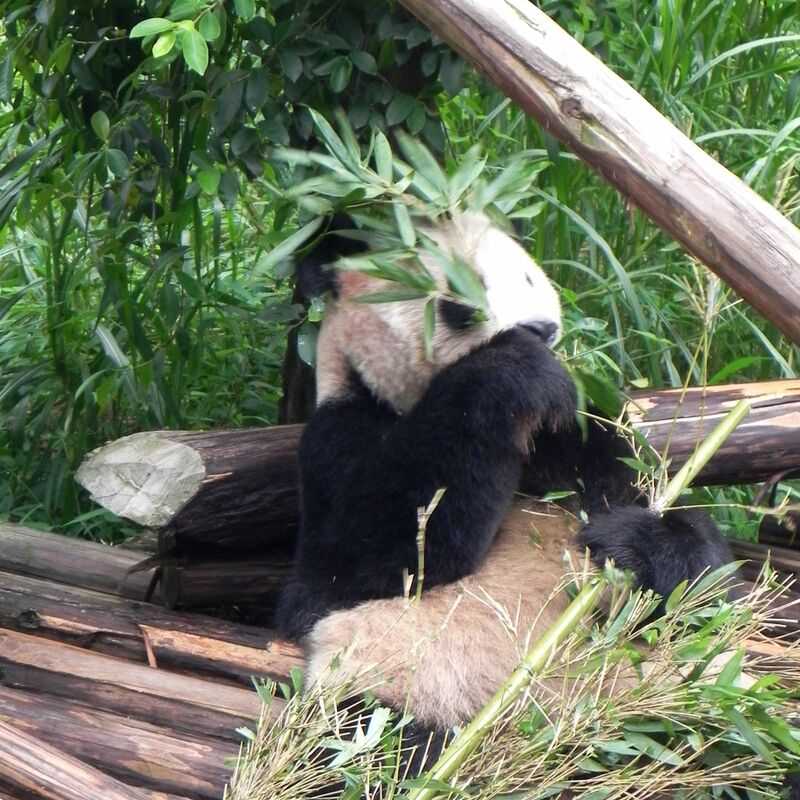 Starting in 1986 with only 6 pandas rescued from the wild, Chengdu Base efforts led to the births of 124 Giant Pandas. 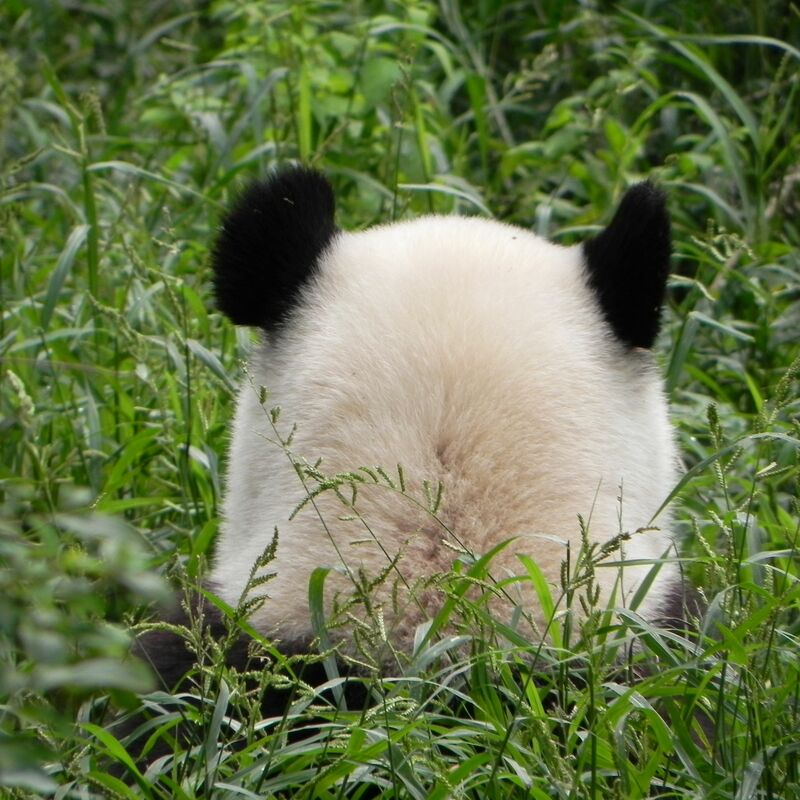 Despite the difficult beginnings, 88 of pandas survived with most of them still living there today. 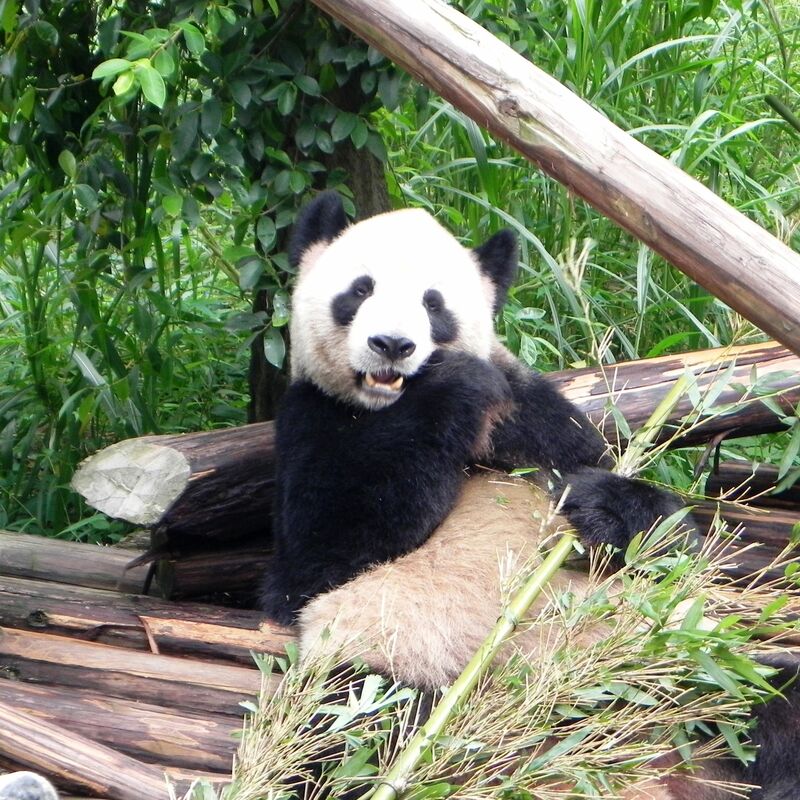 The Chengdu Research Base of Giant Panda Breeding offers the possibility to “get close and personal” with pandas. 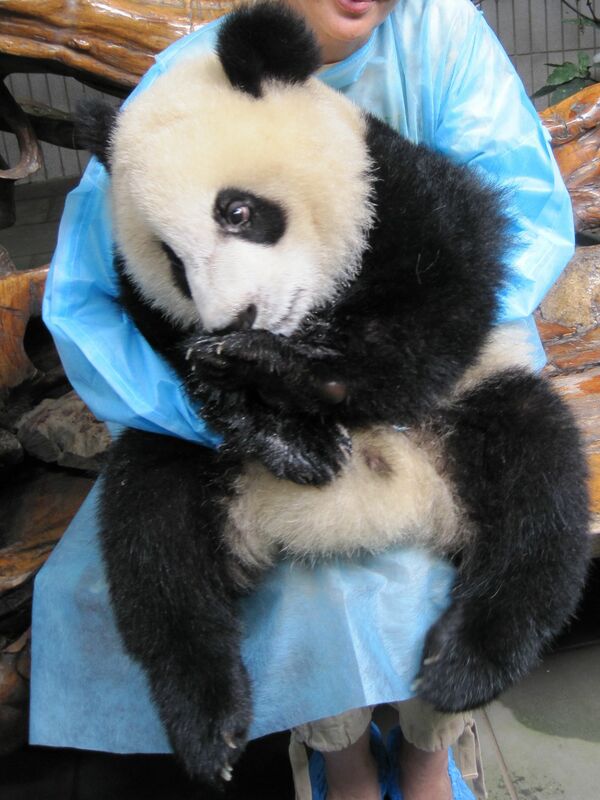 At the cost of the “small donation” to the Center (about $150) you will have a chance to hug the panda, keep it on your lap….. and believe me, it is an unforgettable experience. 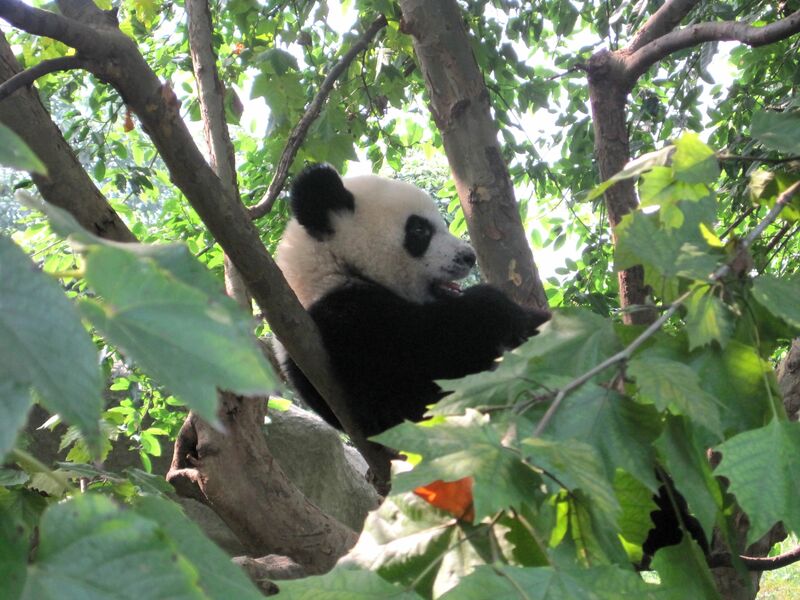 And the best is that the donation is going entirely for the panda’ research and conservation efforts. 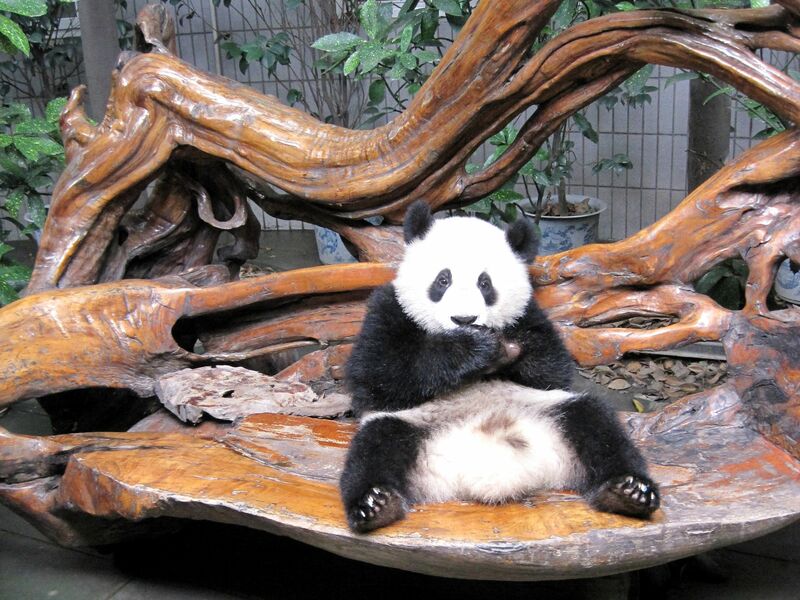 Before the giant panda grows to an adult, it goes through infancy stages as shown on these pictures. 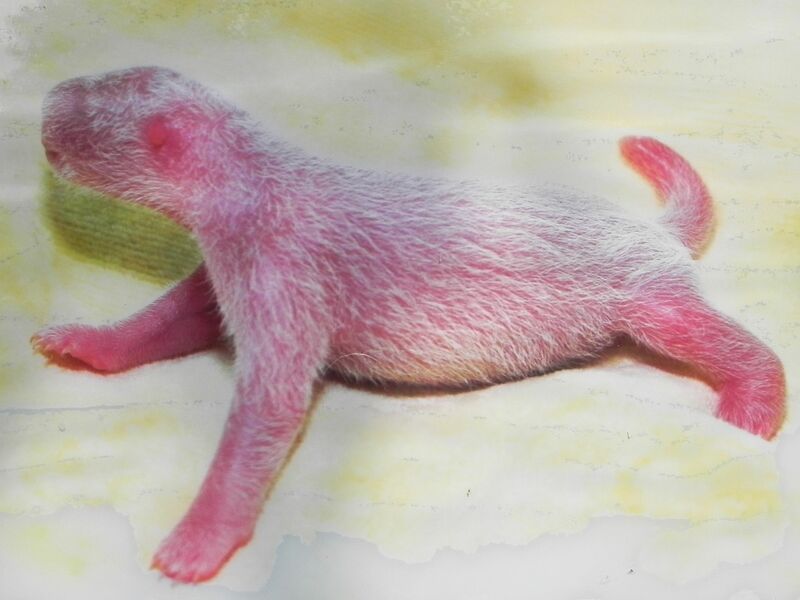 It is born blind, toothless and has pink color. ... a kiss is just the kiss..., but a hug is really the Hug! Relaxing, curious or "on duty" ? 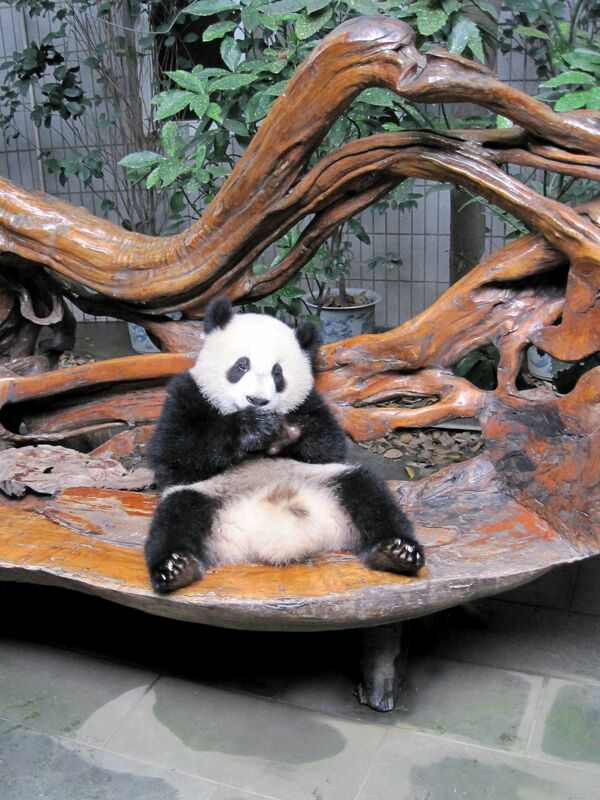 On top of having personal "relationship" with the giant panda bear you also receive this certificate of love as a recognition of your donation. 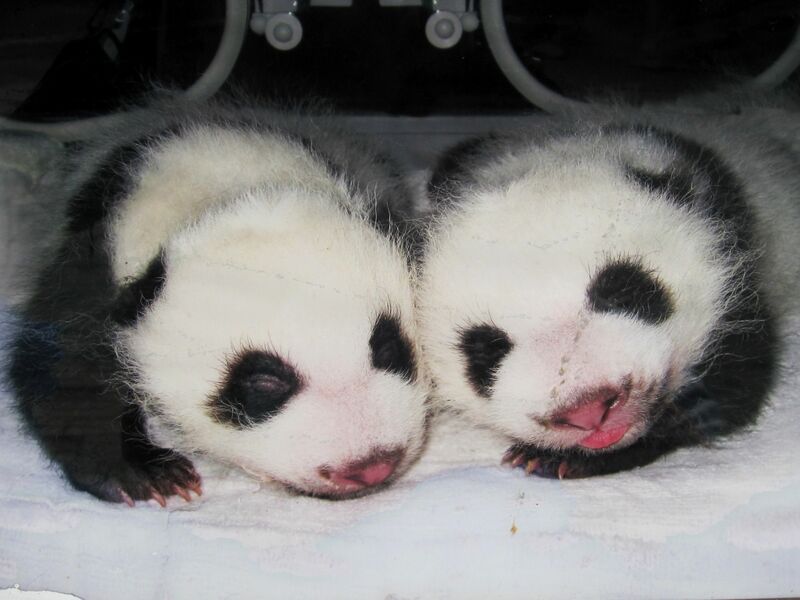 in 1990 the first pair of giant pandas twins were born and successfully hand-risen. In the wild, if twins are born, usually only one survives. The mother selects the stronger one to feed letting the weaker baby to die. 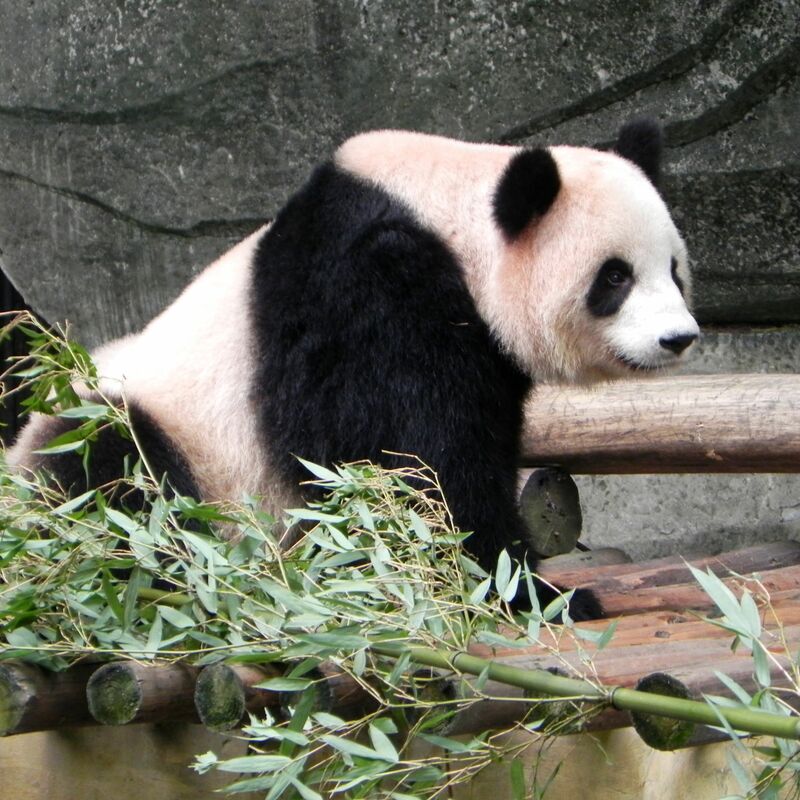 It is understood that this is due to the fact that the mother panda does not have enough of milk for two cubs. 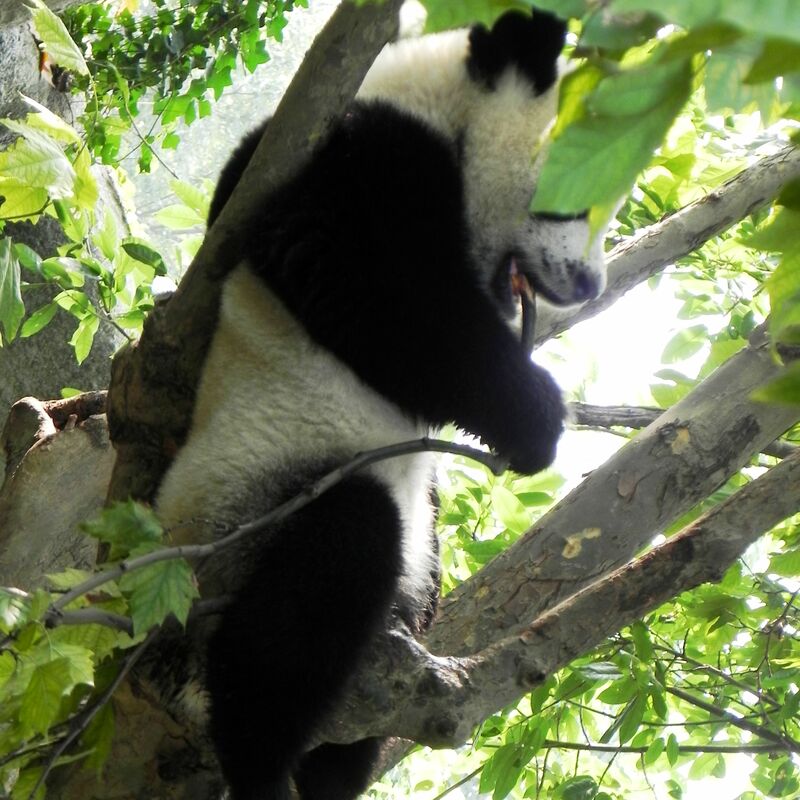 Indeed the young is entirely on the milk diet for almost one year when finally his teeth are fully developed and youngster starts to feed on bamboo leaves. 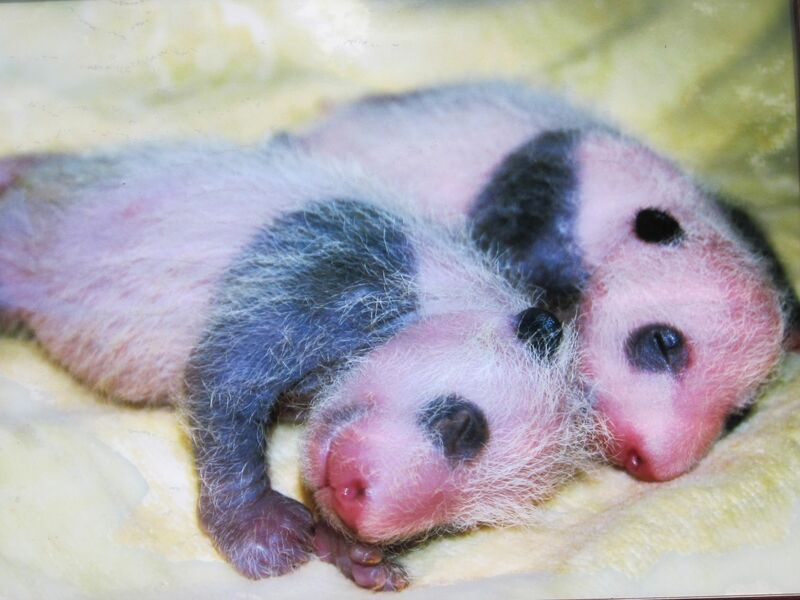 Qing-Qing - a Hero Panda Mother gave birth to the total of 13 cubs (in 9 litters) and all of them survived. 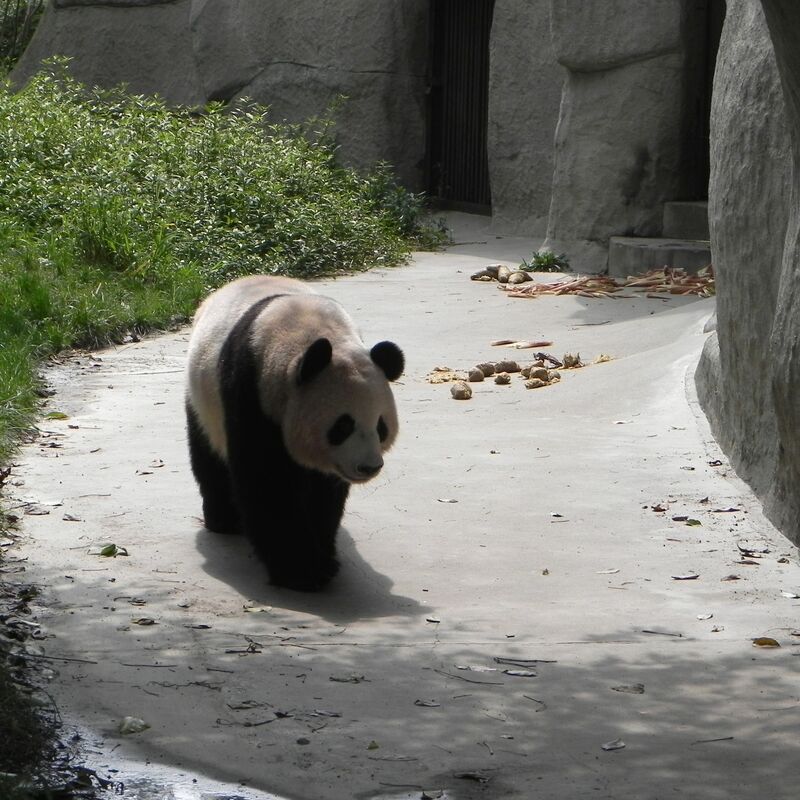 She broke the previous record of her mother Mei-Mei with 11 cubs in 9 litters. 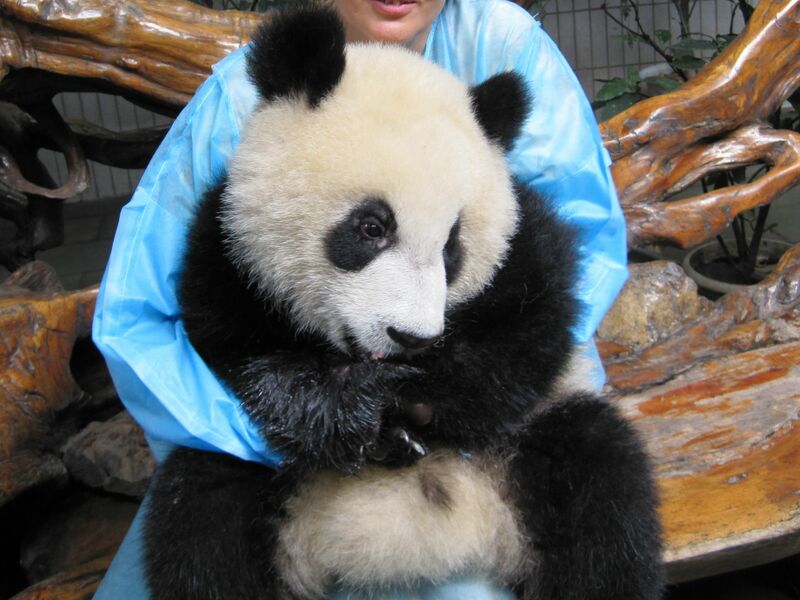 Mei-Mei after giving birth and nursing Qing-Qing (one of twins) was sent to the Adventure World in Shirahama, Wakayama (Japan) in 2000. There she gave birth to 9 cubs (in 5 litters) with 7 of them surviving in 2007. 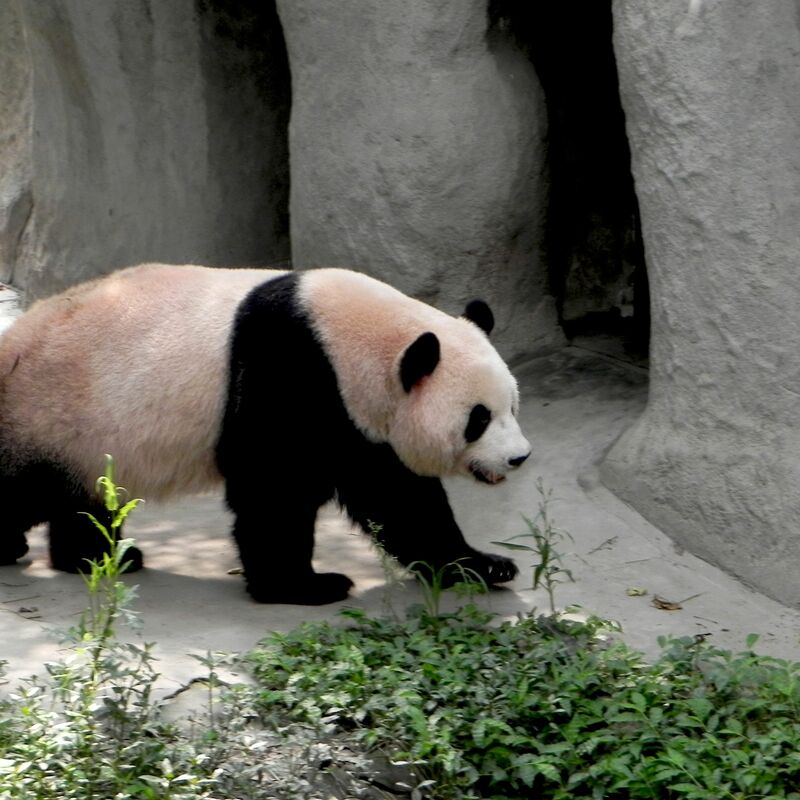 She was given the name “Great Mother” by Japanese fans. 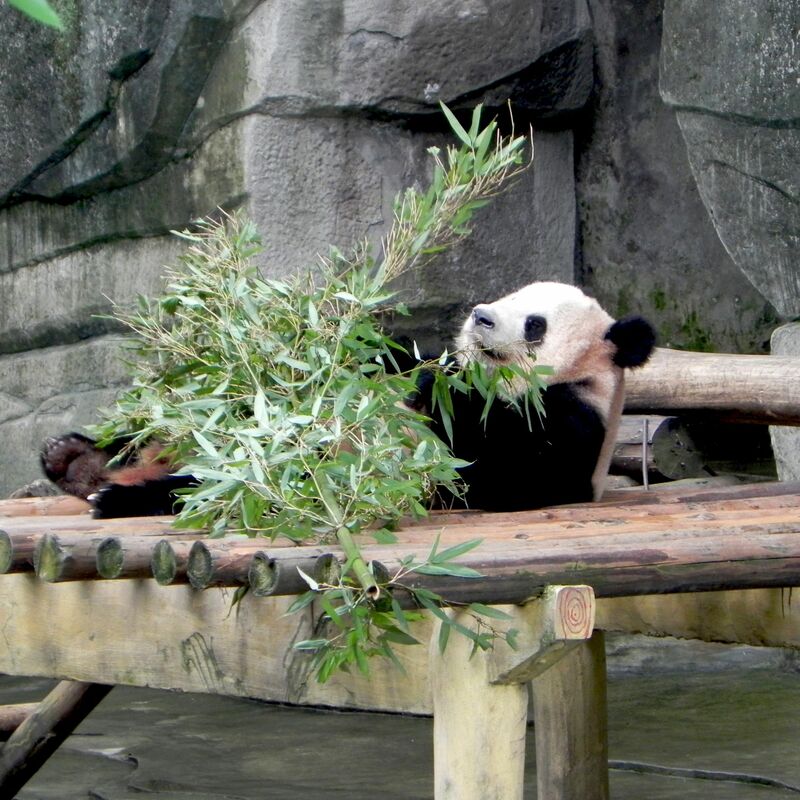 In 2006, Panda Qi Yuan gave birth to the cub weighting only 51 grams (imagine – it was only about 0.2% of the mother’s weight at that time). 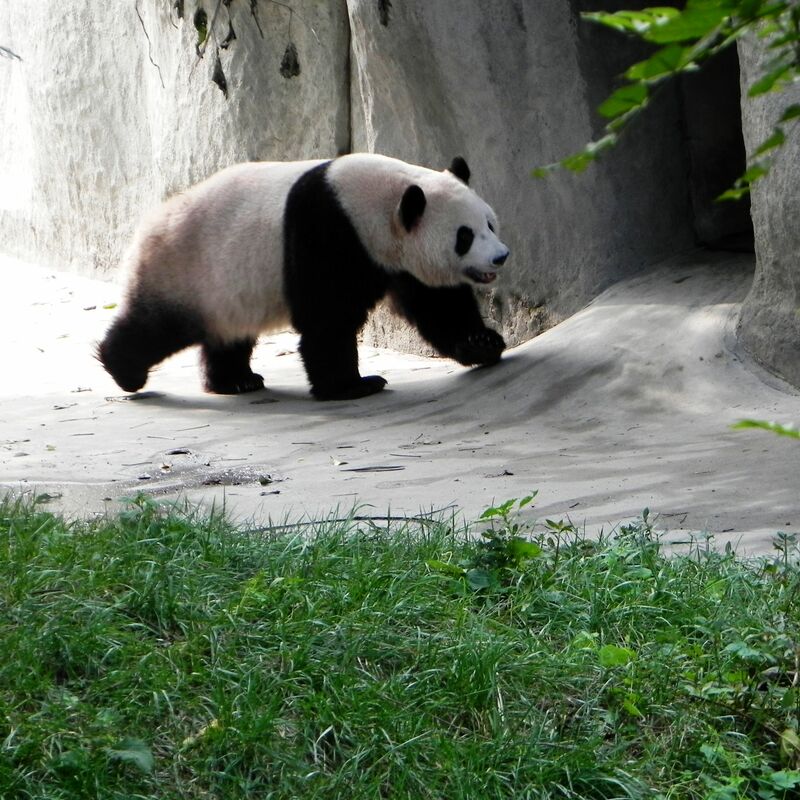 The “51g” cub (as it was later named) successfully survived all life threatening situations and now as a fully grown adult is still living in Chengdu Base.